The weather forecast for tomorrow evening is clear and warm, which sounds like a fabulous evening for hauling out the fire pit, a bunch of chairs, and some marshmallow sticks. And, looking at our event calendar, we see that is, in fact, what we’ve got scheduled for tomorrow night. It’s our first Campfire Bookclub meeting. There are still some tickets available, and if you can speed read, you can probably finish J. G. Ballard’s High-Rise in time to talk cogently about the author’s understated commentary and wry dark humor about the human condition. And if you don’t finish the book in time, well, we’ll still let you use a marshmallow stick. Once. The next Campfire Bookclub is coming up on August 18th, and the book we’ve selected is Jonathan L. Howard’s Johannes Cabal the Necromancer, which is more like Christopher Moore meets Jim Butcher than Ballard’s William Golding meets Anthony Burgess. Counterpoint, if you will, because we’re keen on that sort of thing. In between nights with fire and marshmallows and books, we’ve got our summer edition of our coloring night. It’s on July 20th this time, which is a Wednesday. Eventually, we’ll cover every night of the week, making sure that all of you delightfully busy but earnest friends of the bookstore have a chance to come out and sit and color and have some snacks. We can already sense that this newsletter’s theme is “have some snacks.” Probably says more about the proximity of lunch than anything else. Did we mention that we’ve got a new bookmark? No? We just teased you about it a few weeks ago, didn’t we? That’s so mean of us. 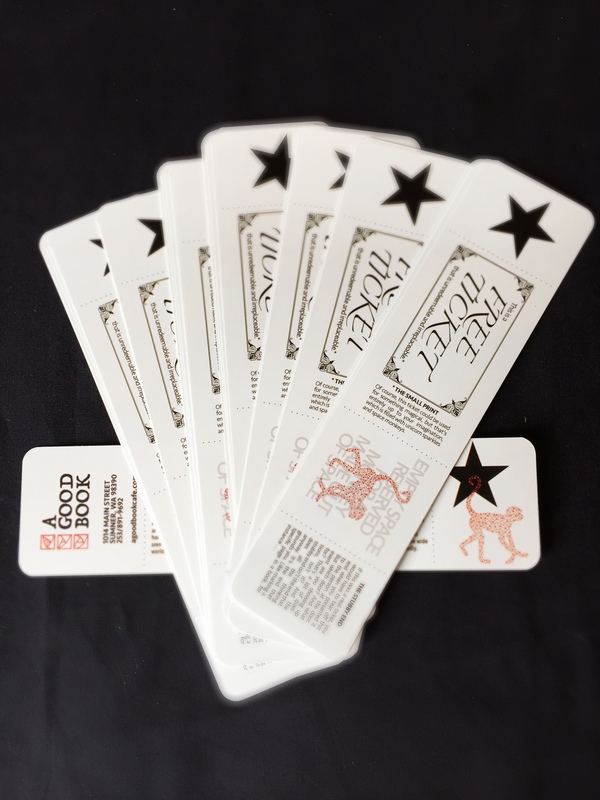 Thankfully, the bookmarks have actually arrived, so you, too, can delight in having an official A GOOD BOOK branded piece of swag. Come down and pick one up while you’re selecting your summertime reads. Let’s see. What sort of cool new books could you put a space monkey bookmark in? 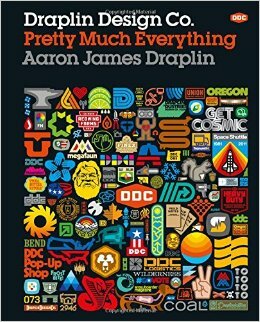 Mark’s been bookmarking damn near every page in Aaron Draplin’s Pretty Much Everything, the only design book anyone ever needs. Draplin is based out of Portland, OR, and odds are you’ve seen one of his designs in the last ten years or so (*cough* Field Notes *cough*). And it’s not just a eye-catching tome of fancy graphics and whizz-bang layouts; Draplin has a wicked sense of humor about his work, and there are many tiny details in his ad copy that makes the presentation entertaining. 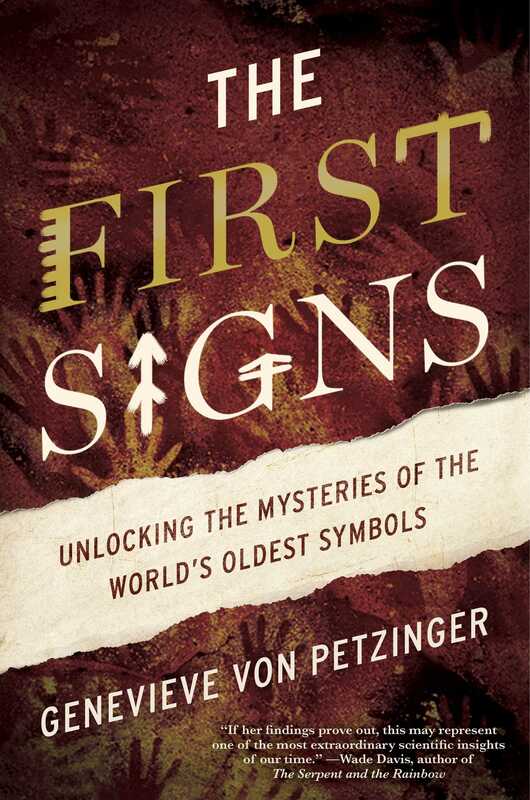 Speaking of specialized symbols, Genevieve Von Petzinger has a new book called The First Signs. She’s interested in European Ice Age art, and has assembled a unique database that charts more than five thousand signs across more than four thousand sites in Europe, establishing an argument that the thirty-two distinct symbols she has noted in her efforts are, in fact, the rudimentary origins of language. In the Victorian Crime Fiction Department, we’ve got the first book in William Sutton’s new series. 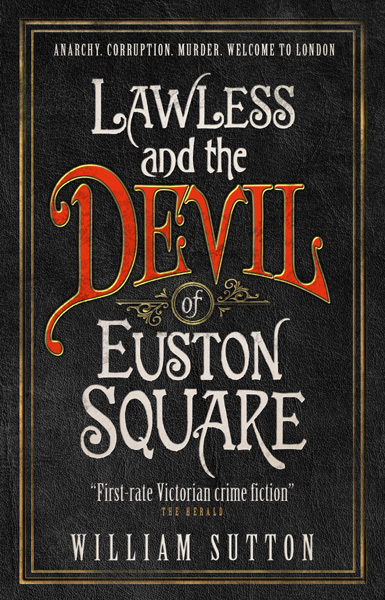 Lawless and the Devil of Euston Square. It’s out from one of our favorite genre publishers out of the UK. In this volume, novice detective Campbell Lawless is tracking down elusive revolutionary Berwick Skelton, and he’s aided in his search by those Victorian-era staples: a mischievous gang of unruly street urchins and a vivacious and perspicacious librarian. 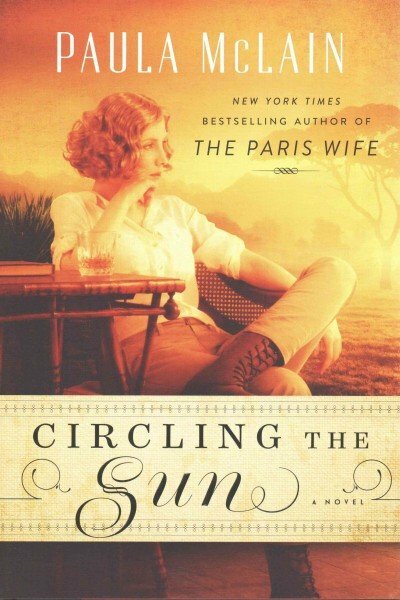 Speaking of perspicacious heroines, Paula McLain’s Circling the Sun is now out in paperback. The Paris Wife, her book from a few years ago, has a been a consistent favorite around the store, and we’re delighted to have her new book on the tables now. 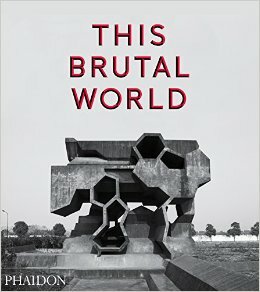 Oh, and the new Phaidon art book about Brutalist Architecture is out. Black and white, of course, because that’s the sort of stern photography such architecture demands. Alice: Oh, I see what you did there, marmot. There’s a monkey on your new bookmark. That’s the space oddity you were talking about a few weeks ago. Alice: I thought you were making a David Bowie reference. 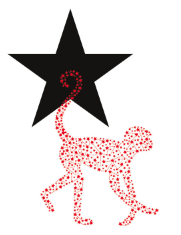 Colby: Where do you think that blackstar graphic came from?